Clove Bud Essential Oil (Syzygium aromaticum) has a medium‐strength spicy, warm, and slightly fruity aroma presenting a top-middle fragrance note. Rocky Mountain Oils added Clove Bud Essential Oil to our Relief and Energy collections. The hot oil creates a warming effect, so always dilute Clove Bud Essential Oil with a carrier oil to prevent skin sensitization. Twist open the bottle and breathe deeply, or diffuse the oil, to uplift and stimulate energy. Clove Bud oil also may be used as an insect repellent. Massage into feet before bed. Wear a pair socks to bed and let it absorb throughout the night. Possible dermal irritant, apply a carrier oil for topical application. Not to be used on children under 2 years of age. Works great when I have a toothache. This is one of my favorite oils. It smells great and can be used for so many different things! I bought this product because I was looking for a scent I would enjoy using as a breath freshener. It's pretty strong and just a little bit is needed. I take it to work and love a little misty spray every now and then throughout the night. I enjoyed the smell combine with your orange EO. Made my place smell like winter holidays. I use this in the kitchen during the holidays, mixed with Orange oil, Warm & Cozy or even Candy Cane, sometimes all of them together! i do really like this oil, i use it alone or blended. it is very versatile in blending with other oils, it is strong and will stand out. I just received this oil yesterday along with other oils and it smells heavenly! I’ve added 3 drops cinnamon bark, 2 drops clove, and 2 drops nutmeg to my diffuser and my house smells amazing and it makes me feel so alert! I love RMO. Bought for DIY Pest Control in My Garden. I expected this to overpowering but it has a very pleasant fragrance. I actually bought it primarily for my garden for natural pest control. I find cinnamon doesn't quite grab me and cassia is too rich. Clove bud is somewhat in the middle: warm and spicy. Powerful too. 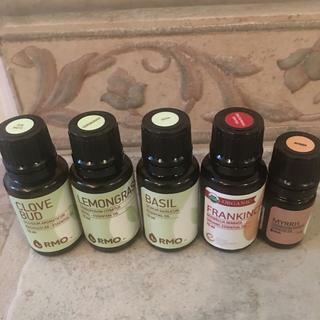 Just a little of RMO's clove bud goes a long way. one of my favorites- it smells exactly the way it's supposed to. I love this oil - it mixes well with so many oils! I Like to blend with Fir needle and Eucalyptus for a cooler winter scent. The smell alone is worth the purchase. It's perfect for the diffuser, blended for mouth issues from teeth to blisters. It's a must! This oil is one of my new favorites! I got it as an add in for my DIY toothpaste for sensitive teeth... I have been diffusing it at my office with orange and frankincense. It smells wonderful! LOVE IT!!!!! Works great as a muscle rub with carrier oil. I love it! I was having very bad tooth ache, I put a few drops of this oil on cotton swab and pressed it against my tooth, in less then an hour the pain was gone and by next day morning I was perfectly normal. It's almost been 3 wks since then. This is a must have oil in our medicine cabinet! Very pleased. Really love this mixed with orange and cinnamon blend. You only need a few drops to get really strong scent. Pure scent, rich and warm. Great purchase! I was really impressed with the Clove Bud oil. It is nice and spicy and can clear up any sinus problems quickly. Also just a nice scent for the holidays. Very warm/spicy fragrance. I add it to Immune Strength since I don't care for the smell of that. Much better. I use this in my kitchen, makes the air smell wonderful. Compared this to the Doterra clove and in my office and we all liked this better! Very nice in the diffuser. So many uses for Clove and the smell to me is awesome. It is a hot oil so you must use a carrier oil but with this and a few other, I made my own mix of a popular YL blend and I love it. Clove is awesome and RMO has a fine quality. I love all they have. One of my favorites. Great quality. Has many purposes. I love this oil. It's kind of a spicy, Fall-ish scent, and is a great anti-bacterial. Definitely recommended. I love the earthy smelling oils. I use clove bud to make my thieves oil mix. This has a wonderful clove scent. I LOVE Clove Bud. It is great to diffuse by itself, I highly recommend. This is such a great oil. I absolutely love the aroma of it. I've added it to my coconut oil when I oil pull as well as added to my diffuser with some other essential oils to clear the house of any foul odours (ie salmon). I ordered this because I love the smell of clove. I am looking forward to using it in blends. I did add it to my diffuser at night but think it is more of an energizing oil so will use it in the daytime. Love cloves and orange together!! It's just like a pomander! I use this oil in my bathroom, just a couple drops onto dried rose buds that I dried rather than tossing. I also use in in the kitchen on a oil burner, just add some water and 3-5 drops, and the scent is very homey. Another great oil. Smells pure; sharp, and spicey. Always a satisfied with the scents of your products and your delivery is very fast and packaged well. I wasn't too interested in buying this scent, but caught it on sale and it was worth a try. It's amazing. I like the smell by itself, but I love it more blended with other oils. Does this come in 30ml bottle? BEST ANSWER: The largest size we carry for our essential oils is 15ml. Can the CLOVE OIL be taken internally? Is this the same as thing as Eugenia caryophyllata? BEST ANSWER: Yes, they are the same. Why don't they offer smaller size bottles anymore?? I used to buy from NAN 5ml bottles. BEST ANSWER: The majority of 5ml bottles were discontinued, due to lack of popularity. There were not in high enough demand to keep.